This is dedicated to my dear friend Linda, who has so bravely started her sewing practises and already finished at least 3 pyjama pants for her daughter and one pair for herself. May you keep sewing them pants and next time we'll have to learn something new, maybe shirts? And then dresses for summer! Or or what about bags?? The whole pyjama pants fascination started when I made her a sewing kit for her birthday present. I cut the pants and elastic, drew the instructions and she just had to sew them together (and the finished pants look awesome by the way). I wanted to take pictures of all the stages, but I run out of time (sorry Linda!). But now I've taken photos of all those steps PLUS how to cut the pants without any pattern!! Interested? So these are the pants we'll be making (the picture above). I didn't get any pictures of the finished pants on their own as she was watching me make them like a hawk and as soon as they were ready they were on her, and they haven't come off since. So I'm guessing we're having a pyjama kind of day. Anyone can make these so do give it a try, they are EASY! 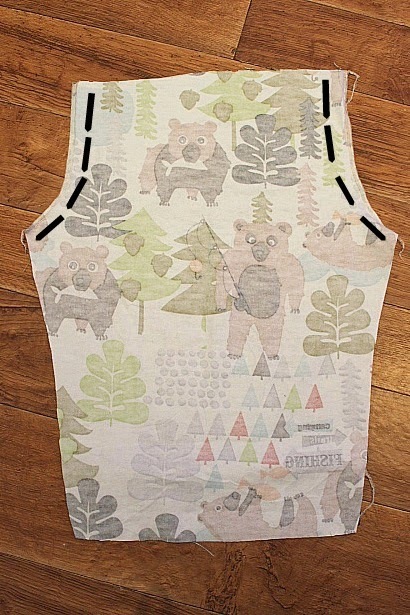 You will need some cute flannelet fabric, existing pyjama pants, elastic and obviously scissors and a sewing machine. 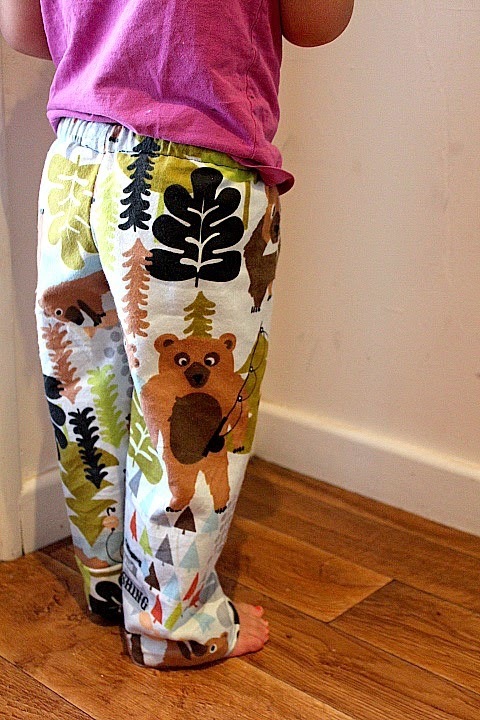 The pyjama pants, that you will use as a pattern, don't have to be exactly your child's size. Pj's are very loose so if it wasn't for the length, my daughter could still fit size 1 pyjama pants though her normal size now is 4. So I could even use size 1 pyjama pants as my pattern, but I would have to add enough length. Make sense?? I have tried to put two pictures side by side and I will give instructions below the image. Now let's get started already! Turn the pyjama pants, that you are using as the pattern, wrong way around so that you see the seams. 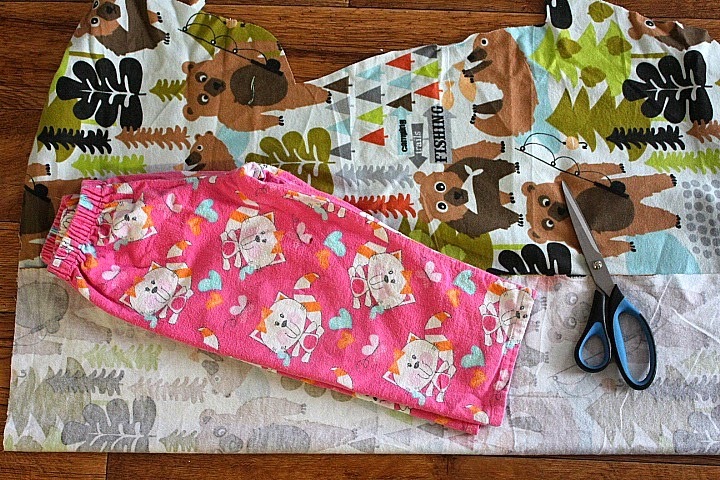 Fold the fabric so that you will fit one pant leg on it, right sides together. The long side of the pyjama pants will go along the folded edge of the material and the crotch is the curved part (image below, right side). Remember that you will have to leave plenty of fabric over the waistband as you will be folding it back to fit the elastic in the waistband of your new pants. Then it's time to cut! Start cutting from the bottom (here is where you add some length if you need to). Remember that you will be folding this over at the end as well so you need to add a little bit extra anyway. When cutting everywhere else I usually leave 1cm seam allowance (meaning I cut 1cm from the edge of the pattern piece). When you get to the cutting of your waist area remember that the elastic gathers the fabric. Meaning that DO NOT cut along the pattern pants for the waist, but instead cut straight after the crutch curve (look at the picture above again). If you don't like cutting with the pants on top of the fabric, use a pencil to draw around the pattern pants first and then cut along that line. This is totally optional and I for once don't do this. Obviously you need too pants legs to to make pants, so to cut the other leg I use the one I've just cut. That way I don't have to leave any seam allowance and the two leg pieces will be exactly the same size. Now unfold your two pieces and put them together with right sides facing each other. Your pieces should look like the ones in the picture above. Then sew along the curved edges (along the black lines that I've marked in the image. Don't sew anything else just yet. Instead grab the scissors and cut a little strip off from the middle of the waist. I haven't marked it on the image (silly me), but you can see that the right end of the waist is higher than the left. The higher side will be the back of the pants and lower side the front. Turn the sides that you just sew together and your pants will actually resemble pants! Now sew both of the legs. Start from the bottom of the other leg, doesn't matter which one, and go around to the bottom of the other leg. Your pants are now real pants. All you need is the elastic on the waistband so that the pants will stay up. 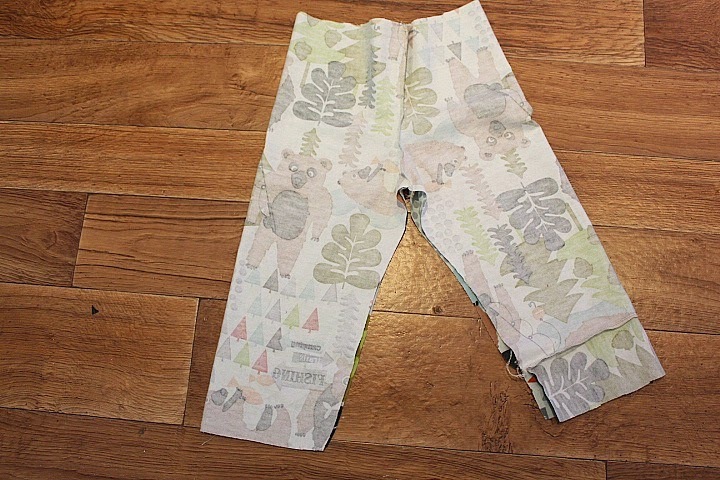 Use your child (if you're making these pyjama pants for her) to measure how long piece of elastic you need. Then fold the fabric around the waist and make it wide enough that the elastic will fit through it after you've sewn around the waist. I always use the elastic to help me make sure that it's wide enough. Pin down the waistband and sew around, starting at the back, but remembering to leave a gap where the elastic will fit through. Picture on the left (above) shows the gap. Safety pin works great when you put the elastic through the waist. Once you've put the elastic through the waistband, put the ends of elastic on top of each other and sew together. Then let that last bit of elastic go under the fabric and sew the gap closed. All you have to now do is the hem lines. I use an overlocker as you've probably noticed, but you don't need to. You can just as well do these pants without an overlocker. For example to finish the hem lines, just fold them twice like in the picture on the right. Sew the hems, turn your pants right way around and there you have it, your pyjama pants are READY! 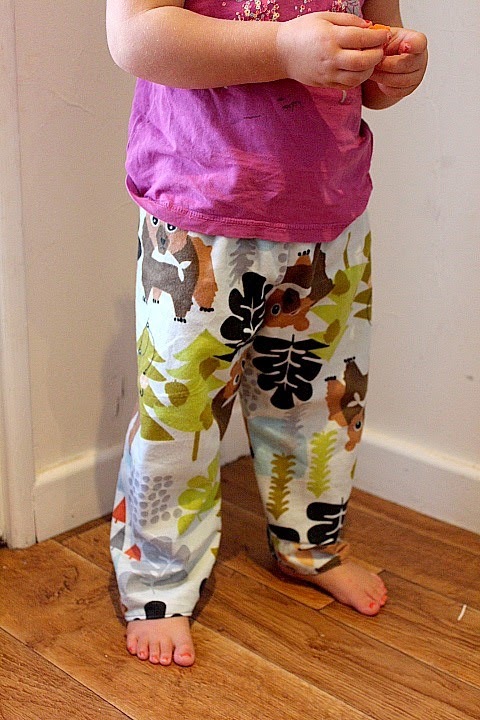 There you have it, no pattern needed pyjama pants that are honestly so easy to make! (If you have any questions or if I wasn't clear enough at some points, feel free to ask for clarification.) Now put them on, be proud of yourself and send me a picture! I love seeing all the creations you guys do. And sleep tight with your new pyjama pants that you have done all by yourself! little people design copyright 2013. All rights reserved. Simple theme. Powered by Blogger.